As I've said before, I love to find fashionable jewelry at a good price. Jewelry Payless has every type of jewelry you can imagine in all different styles. There are girly styles, which suit me, as well as more "modern" pieces. I've never seen such a large selection of quality jewelry at an affordable price. Jewelry Payless sent me two gorgeous pieces of jewelry: a Silver Cubic Zirconia Open Star Mom Fashion Necklace and a Tiffany Inspired Mother's Day Heart Toggle Bracelet. I absolutely *love* both of these!!! The necklace is gorgeous and looks like I paid hundreds for it. 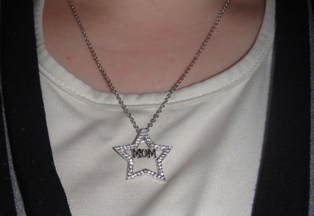 I've gotten so many compliments on it, and I'm proud to wear my title of "Mom" in such a prominent place. The necklace is made of .925 sterling silver with cubic zirconia diamonds encrusting the open star. The word mom inside the star is also made of silver letters. The necklace comes with an adjustable rolo chain of up to 20". I highly prefer silver jewelery over gold, mainly because of the color, and the star is delicate enough for my small frame. I was a bit nervous that the cubic zirconia might look too flashy, but it is very tasteful and doesn't look overly done. It's an all-in-all fantastic necklace! The Tiffany Inspired Mother's Day Heart Toggle Bracelet is made of solid stainless steel bracelet with a heart and toggle link. 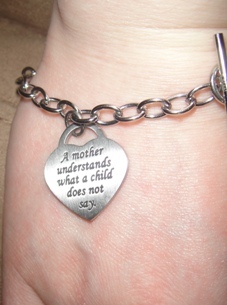 The heart is laser engraved with the world "Mom" on the front and "A mother understands what a child does not say" on the back. 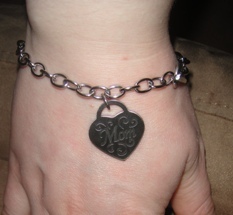 I actually prefer this over a similar bracelet I have that's made of silver. The silver bracelet I own is tarnished beyond recognition, whereas this bracelet should not tarnish the way silver does. It also has a different, lighter feel to it, and the message on the heart is classic. That message is so, so true...there are so many times when I just know what the twins want even though their Daddy is completely stumped. This is such an amazing gift idea for Mother's Day, birthday, anniversary, or really any time. Overall: We give Jewelry Payless a 10/10! First, visit Jewelry Payless, then comment here and tell me about another of their pieces of jewelry you would love to own. 2) Follow @JewelryPayless on Twitter and comment here with your Twitter screenname. 5) Become a fan of Jewelry Payless on Facebook, and be sure to let them know that The Twinners sent you! 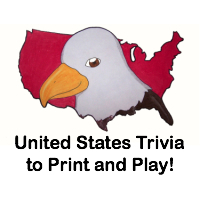 This giveaway will close on December 15, 2010 at midnight. 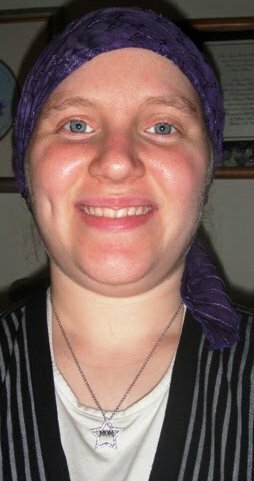 We were sent the necklace and bracelet from Jewelry Payless free of charge for the sole purpose of this review; no other compensation was received. All opinions expressed are my own. I love the Sterling Silver Elsa Perretti Teardrop Tiffany Style Necklace. I like Jewelry Payless on FB. entered the PJs for the cure giveaway. I would love the 16" Silver Rolo Necklace w/ Engravable Heart Tag & Toggle Pendant. I am following this blog on Google Friend Connect. I am following @JewelryPayless on Twitter screen name gotthebabybug. Following @TheTwinners on Twitter screenname gotthebabybug. love the Sterling Silver Elsa Perretti Teardrop Tiffany Style Necklace. I love the sterling key necklaces. I would love to have the Handmade Natural Big Seashell Pendant Leatherette Necklace! It's beautiful! and I let them know that The Twinners sent me. I love jewelry! ^_^ I am torn between the Vintage Cognac Amber Square Earrings and the sterling silver bubble bezel earrings but I guess I'll decide if I win. I love the Vintage Cognac Amber Dangle Square Earrings! I like the love butterfly ring. Entered Touch The Art giveaway. I like the sterling silver key pendant necklace. I like the XO Topaz Orange CZ Cubic Zirconia Sterling Silver Tennis Bracelet. I'm fan of The Twinners Reviews & Giveaways on Facebook.